Art is expression of the ideal. Without these images of perfect people and fantasy novels, where would dreams and goals come from? 6/10/98 - Hello. The most recent stuff is "2nd Chance." Please keep in mind that both the rough layouts and the much nicer finished pieces are available. Pencils of pages 1-7 from "2nd Chance"
2nd Chance, Page 1/7, and it's corresponding layout. 2nd Chance, Page 2/7, and it's corresponding layout. 2nd Chance, Page 3/7, and it's corresponding layout. 2nd Chance, Page 4/7, and it's corresponding layout. 2nd Chance, Page 5/7, and it's corresponding layout. 2nd Chance, Page 6/7, and it's corresponding layout 1 and layout 2. 2nd Chance, Page 7/7, and it's corresponding layout. Pencil Excerpt (pages 3-7) from "The Phoenix Crusade"
The woman in the white and gold armor desperately needs a name - I'm open to suggestions . 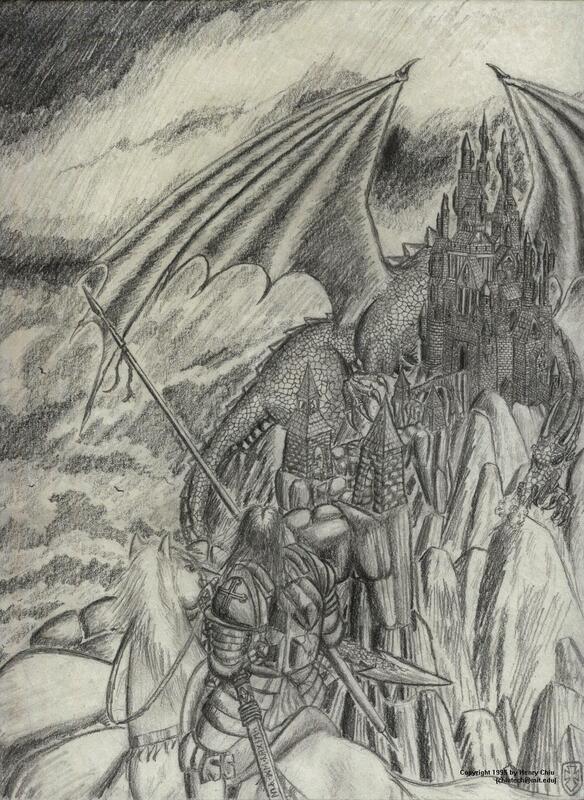 . .
Pencil drawing of a castle, complete with obligatory Knight and Dragon. I drew this my junior year in high school (1992). Three weeks, five periods a day - yeah! She's trademark and copyright 1995 Top Cow Productions. You should check out their stuff - its the best in the industry. This is a comic book I've been drawing for the past two years. Issues 5-8 are available online. There is an average of 7 pages per issue. In general, SDC (Snapdragon Chronicles) is a hybrid science fiction/fantasy story about the interaction between a magical world and ours. The year is 2012 A.D.. I also have additional artwork that has been published in 15 RUNE: An MIT Journal of Arts and Letters. Having trouble viewing the downloaded images? Get LView Pro v1.9 , by Leornardo Haddad Loureiro! MS Windows only. Eri Irazawa, one of my mentors, she's both a very good writer and artist. Aimo - She is a very promising young artist. Jennifer Kolanek - The creator of my favorite web-based comic book, RunAMUCK. Check it out! Hiro^2 - probably the most famous of us, Hiro^2 has my highest respect. Not only is he damn good, but he hosts pages for internet-challenged artists as well as some pretty good "how-to-draw" lessons. Want to know more (like I've actually told you anything!) about me? Take a look at my Homepage as well! Yes, you click on the little picture . . . good boy . . .
You can also email me (chiutech@mit.edu), or even better yet, you can finger me to see if my computer is up and then talk to me. Have you read the COPYRIGHT INFO? 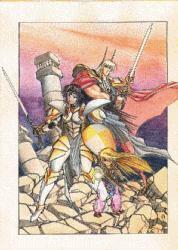 With exception of Velocity, all characters are copyright and trademark 1995 by Henry Chiu. Ohani, Siana, Rhyo, Chiga, and Kaput are from a comic strip I draw that is published roughly bimonthly in Voo Doo: The MIT Journal of Humor. The strip is called, "The Snapdragon Chronicles", averages 7 pages an issue, and currently there have been 8 issues plus one 3 page special. But anyway . . .